Alliance Reiki Master, certified Taiji and Qigong instructor, and holistic health educator, Mary Sturtevant is Associate Professor Emerita and former Director of the Health Education Program at Tufts University in Medford, MA. She brings over 30 years of teaching and counseling experience to enrich her holistic health and healing work. Mary’s approach comes from a heart space, providing a safe, nurturing environment as you explore pathways to harmony, health, and healing. Mary is a student of nature and seeks the forests, mountains and streams as sources of renewal for body, mind, and spirit. She has hiked the Appalachian Trail, The Cohos Trail x2, the Long Trail x2, Metacomet-Monadnock Trail, Monadnock-Sunapee Greenway x2, NH 4000-footers, NE 4000-footers, Northville-Placid Trail, Wapack Trail and a significant portion of El Camino de Santiago in Spain. When not hiking, backpacking, or playing in the outdoors, Mary can be found at “Path of Harmony,” her business and her spiritual path, teaching Reiki, Qigong, Taiji and Native American Flute. After spending approximately 30 years as a university faculty member, Mary’s path took an unexpected and life-changing turn. Since 1994, she has embraced Path of Harmony as her life’s work and her spiritual path. Within this framework, she offers Reiki, Qigong, Taiji, and Native American Flute classes and workshops. She began her Taiji/Qigong studies in 1990 and began teaching in 1993. Her original focus in Taiji was the martial form. Early in her teaching and practice experience, she was drawn to the medical (health enhancing) benefits of Qigong. Some of her Taiji-Qigong teachers include: Lao Shur Mary Pabst, seventh generation in the lineage of Guang Ping Yang style of Taiji, from whom she learned the form; Lao Shur Diane Hoxmeier Rabinowitz, sixth generation Guang Ping Yang Taiji, from whom she learned sword and fan form; Grandmaster Y. C. Chiang lineage bearer of the Guang Ping Yang Taiji form; Grandmaster Henry Look who introduced her to I-Chuan; Sifu Michael Johnson from whom she learned weapons forms and, more importantly, that the only limitations we have are the ones that we place on ourselves; Master Yun Xiang Tseng, philosopher,healer,teacher, Daoist priest; Francesco Garripoli and Daisy Lee from whom she has learned forms and gentler ways of being; Lao Shur Kenneth Cohen from whom she learned Qi healing forms and Hunyuan Qigong; Lao Shur Paul Mahoney from whom she learned Taiji Ball Qigong; Master Zhongxian Wu–Shamanic Orbit Qigong; and in China she studied with Master Wan Su Jian, Madame Wang Yan and Master Jiang Nan – all very powerful Qigong beings who shared several forms of Qigong. When she was discovered by Reiki in 1992, that became the very powerful and gentle source of her personal healing work. 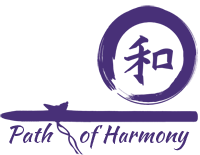 As a Reiki Master, she is dedicated to the principles and practice of Reiki on a daily basis, and to sharing Reiki with all those who are open to the practice. 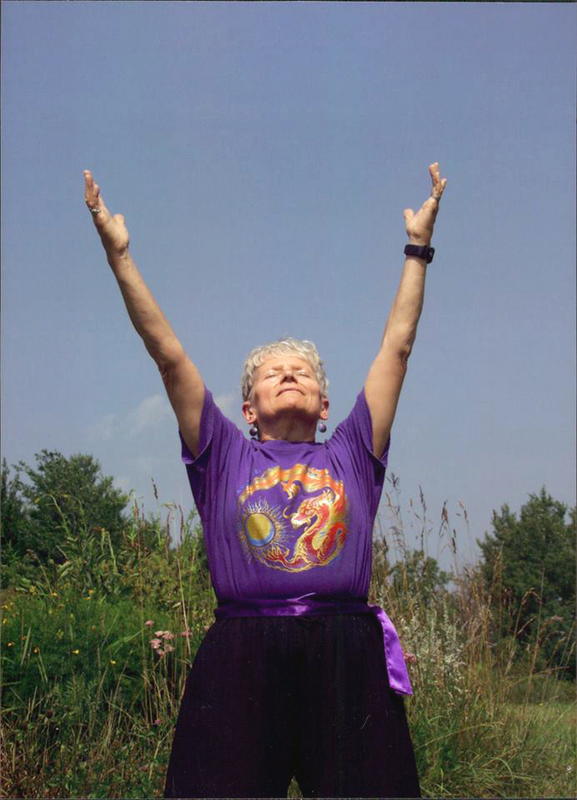 Similarly, she is dedicated to her daily Qigong practice for health, healing, and well-being. She has experienced these practices as complementary modalities and each is vital to her process of being and growing. 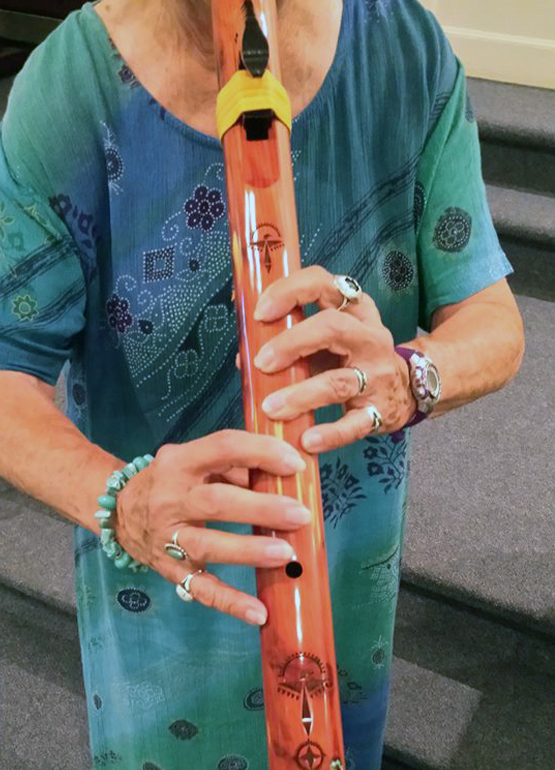 More recently, her energies have been drawn by the Native American Flute and this beautiful instrument has become a source of healing, creativity, meditation, and relaxation. It is a joy to share this instrument with other like-minded beings on the journey.